Our house has a side entry that gets a lot of traffic. The door leads out into the driveway and is used at least a zillion times a day. The side entry door used to open right onto a tiny basement stair landing which I'm sure you can imagine, wasn't the safest or the roomiest. The previous owners had a tiny addition built onto the side entry which gained us a little bit of space but not much. It's a bit of a hodge podge space - super ugly if I'm being honest. There is a tiny nook in the side entry that had been driving me crazy. It was so messy and disorganzied. Yesterday I decided that it was high time I cleaned / purged / organized the little space. 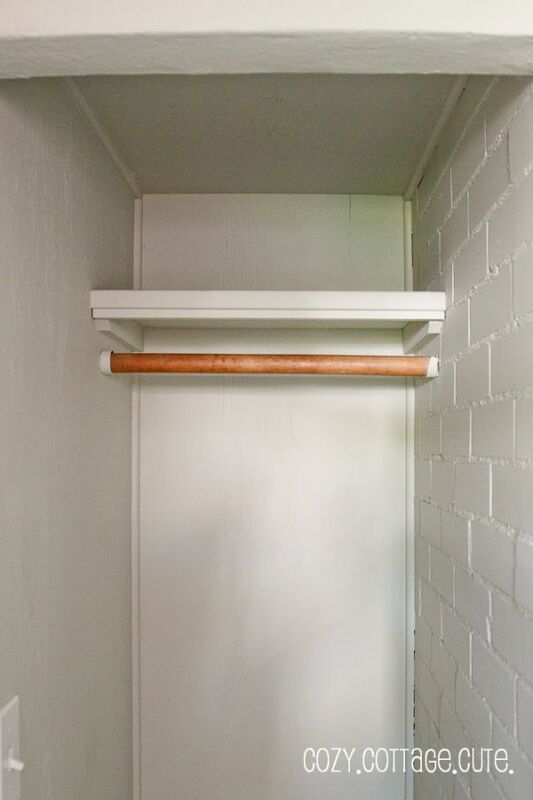 Here's how the little nook looked this morning after I moved all of our winter coats and snow pants to a different closet. The top shelf had a small wooden Christmas box (?!?!?) stuffed with dog toys, baseball hats, and miscellaneous junk. Not only did the box have snowflakes on it (and it's August), it was too small and didn't utilize the full shelf. 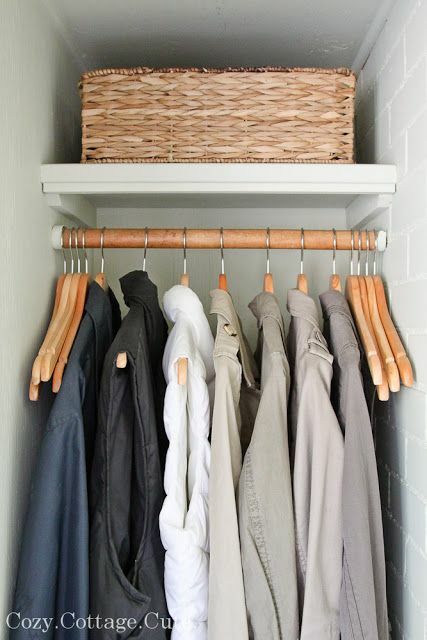 Notice our fall jackets hung on inexpensive plastic hangers. Trust me, this looked way worse yesterday when there were about five winter coats and two pairs of snowpants jammed in there too. The bottom shelf had an old Ikea basket with mittens, gloves, hats, scarves, doggy bags, and leashes. Beside and behind the basket were random tools that Alex was bringing back and forth to The Fixer Upper. Again, the basket was too small and didn't utilize all of the space on the shelf. We also had to dig to find anything. Note: We leave our hats/mitts out year-round because we end up using them for almost eight months out of the year. The temperature has already been dropping to about 6 degrees C (43 degrees F) at night lately!!! 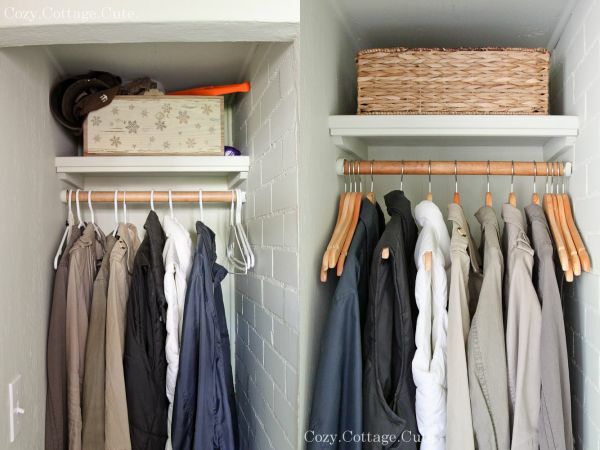 The first thing I did was move our winter coats that we're not using yet to a different closet. That left some fall jackets and vests. After that I took everything out and gave the spot a thorough cleaning. Notice how I used the umbrellas to strategically separate the boy hats from the cute girl hats? Impressive, yes I know. 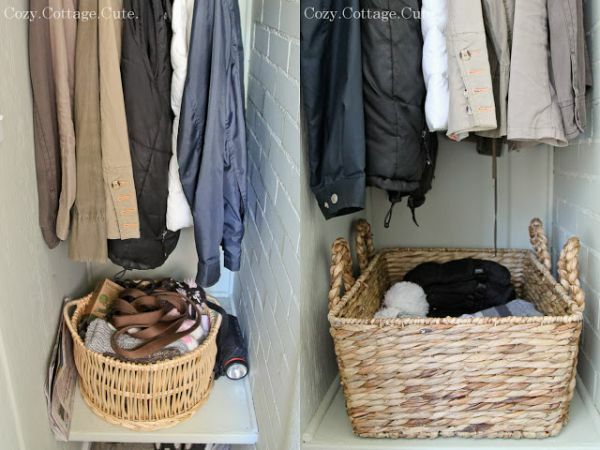 It's amazing how two matching baskets and a set of nice hangers can make you un-hate a spot in your house. 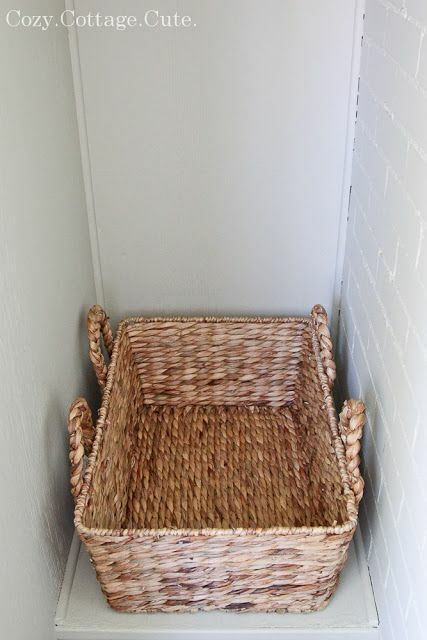 Instead of throwing the dog's leashes into the basket with our hats n' mitts, I would like to add some hooks to the wall on the left. However if you look at the picture below you'll see that there is a light switch right in the way. And a weird piece of trim that serves no purpose. Hmmmm. I'll let you know if/when I figure something out. For now though, I'm pretty happy with myself. If you're wondering how I did this today, it's because Cooper has started sleeping for 30-40 minute intervals during the day instead of the random 2 minute, 5 minute, 10 minute naps he was taking for the longest time.